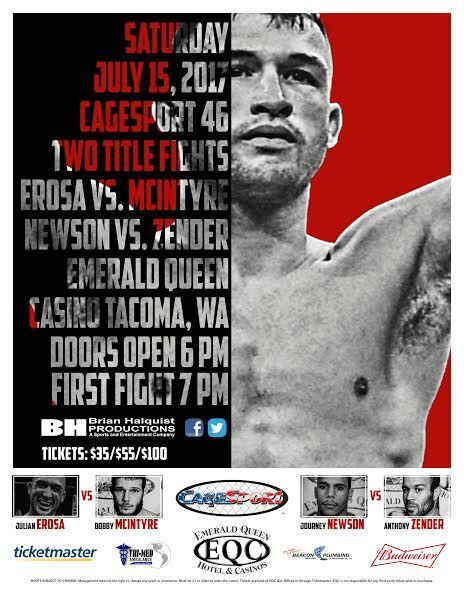 TACOMA, Wash. – Two titles will be on the line Saturday at the Emerald Queen Casino in Tacoma, Wash. when Brian Halquist Productions presents CageSport 46. The premier MMA organization in the Northwest, CageSport will see both its lightweight and bantamweight championships up for grabs on the eight-bout card. Julian “Juicy J” Erosa will make the second defense of his CageSport lightweight title when he meets challenger Bobby McInyre, while Journey Newson and Anthony Zender clash for the vacant bantamweight crown. Both title fights are scheduled for five rounds. The card will also feature six undercard bouts. Tickets are available through the EQC box office and all Ticketmaster outlets. Preliminary bouts start at 7 p.m.Doors open at 6 p.m.
Erosa (19-4) has had a stellar 2017 so far, winning the lightweight title with a first-round submission of champion Justin Harrington on Feb. 25 before successfully defending his championship against Harrington in the rematch onApril 22 when he won by first-round knockout. McIntyre is no stranger to championship bouts, having fought for both the CageSport lightweight title and CageSport interim lightweight title in the past. McIntyre lost his inaugural bid for the lightweight title on Sept. 26, 2016 when he lost to Harington in a thrilling contest. He also came up short in his quest for the interim championship against Bryan Nuro in an equally riveting fight on Dec. 17, 2016. Newson and Zender will meet for the second time in their careers. Newson (5-1) defeated Zender on Dec. 17, 2016 at CageSport 43 by third-round submission. The loss is the lone setback for Zender over his last nine fights as he has posted a stellar 8-1 record since starting his career winless in his first eight contests. Emerald Queen Casino, Tacoma, Wash.